Authors and readers – we have a symbiotic relationship, don’t we? We’re not much one without the other. And as a relatively new author, I definitely appreciate every reader who has picked up Life in Spades. Since releasing Life in Spades, I’ve been fortunate to have a number of bookclubs read about Gina, Cookie, Laura, and Sherry and invite us all to their meetings. We’ve enjoyed great discussions about sisterhood, friendship, and romance over mimosas, sangria and wine, and of course, cupcakes. It’s really been a pleasure hearing from readers what they thought of these ladies and their lives – and what they thought they should have done. Thank you to all my readers for inviting Spades into your life. Last weekend, I participated in a book weekend that celebrated the relationship between the writer and the reader, especially those readers in book clubs. 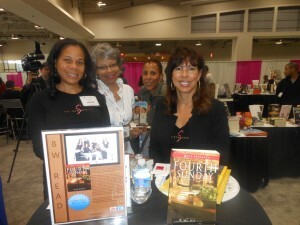 The Black Authors & Readers Rock Weekend, held in Bowie, MD by the Reading Divas, is a unique event which I think may be as enjoyed by the exhibiting authors, as the reader guests. The weekend included a bookclub discussion of “Open Door Marriage”, by Naleighna Kai, a number of panel discussions with authors and publishers, and a keynote speaker, along with the opportunity to shop for books from the authors and Mahogany Books, sip drinks at the bar, and enjoy lunch. The book club attendees came dressed in their matching t-shirts and outfits, lead by the Reading Divas who donned cute pink cheetah print scarves and their “Divas” bling-y pins. I sat on the Movers & Shakers panel with a well-published group of authors, moderated by J’Son Lee author and publisher of Sweet Georgia Press. At the table with me were: Shelly Ellis, Electa Rome Parks, KL Grady, Earl Sewell, and Nanette Buchanan. 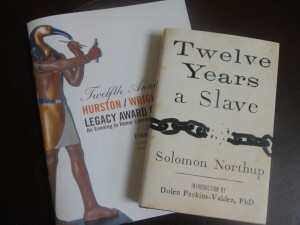 As each author read from or spoke about their novels – covering everything from romance, espionage, mystery, and of course, the girlfriend novel – it was quite evident that there is a wide berth of African-American books out on the market, and that, in fact, there is a market for diverse books, despite what some may say. 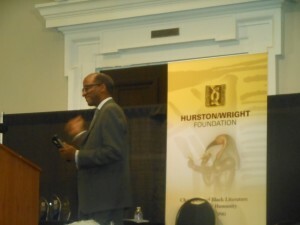 The second panel, Literary Trailblazers, was moderated by WHUR’s Harold T. Fisher. In this round, we heard from Rochelle Alers, Nina Foxx, Donna Hill, Kimberla Lawson Roby and Pat G’orge Walker. The authors talked about some of their own truths and “what no-one knows about me,” creating a new genre as Pat did with Christian comedy, the difference between romance and eroticism, and why the movie is never as good as the book (short answer: because the author rarely writes the movie script.) Kimberla, asked if she ever thought of quitting, said that she does with every book, doubtful that it will be as good as the last. This may seem odd, but that statement made me feel better about my own choice in pursuing this career of writing, knowing that that little wiggle of self-doubt is not uniquely my own. 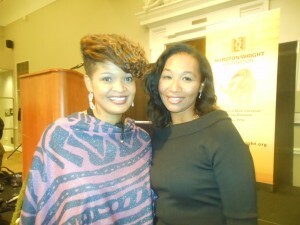 Kimberla Lawson Roby was also the lunch Keynote speaker for Saturday. Starting out in June 1996, she put together her debut novel after-hours while working her regular government job. Once faced with selling her first shipment of 3000 copies of Behind Closed Doors, her husband encouraged her to make the big leap of faith from part-time self-published writer to full-time, then traditionally published, writer. She said she was nervous turning in her two-weeks notice and asked her husband what would they do if this writing career didn’t work? His message to her was one that’s crucial for anyone ready to step out on a dream – then you do something else, what have you go to lose? Her upcoming novel, A Christmas Prayer, will be her 21st book. As a new writer, stepping out onto this journey, it was exciting and inspiring to be included with this group of accomplished writers, as well as interact with bookclub readers. 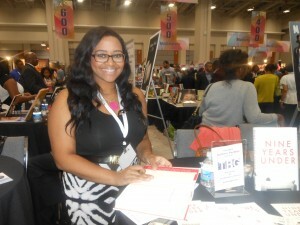 This weekend really proved that Black Writers and Readers Rock! More on how readers can be influencers in my next post. In my novel Life in Spades, Gina expresses annoyance at not only training for a marathon with her boyfriend but now she also has to rearrange her salon appointments to make up for all the sweating and unstyling her hair is going through. The boyfriend is white, he doesn’t understand her hair struggles, she whines. How many of us go through this same balance – physical fitness training and keeping a good looking hair style? According to a 2012 study at the Wake Forest School of Medicine, hair styling and maintenance is a predominant reason for African-American women exercising less than prescribed. There’s of course, implications for general health and weight maintenance issues when we neglect some sort of exercise regimen for the sake of our locks. But it makes sense – who wants to spend hours at the hair salon, spend a good piece of your paycheck, and then go sweat it all out? Is it worth a few pounds? My hair is naturally curly, and admittedly, relatively “easy” as hair goes, but I still think about the hair styling issue when I’ve taken the time to flat-iron it or need to plan doing my hair into my schedule for the day. Running or weight-training isn’t too bad – a ponytail, a headband, a bandana can keep the strands pretty orderly. But a swim or even a stop in the sauna and I’ve got to start all over. I’ve found, however, that a rinse with water and a dollop of conditioner will hold a pulled back bun just fine until I settle down and wash my hair properly. Thus, Gina faces the same question. Her boyfriend is sure that running this marathon will convince Gina’s mother about their commitment to each other. But Gina’s hair appointment schedule is suggesting maybe there’s a better way. Granted, the workout outfit is cute, but still – the hair! This all brings me to the Philly Natural Hair Show this weekend. I’ll be in the Literary Nook with Gina, Cookie, Sherry, and Laura enjoying Life in Spades – and hopefully picking up a few hair tips for us all! Share in the Comments: How do you manage your hair and your workout? 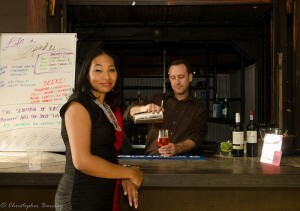 Dolen Perkins-Valdez, the author of Wench, was the entertaining and thoughtful Mistress of Ceremonies for the evening. Her excitement about the authors reminded me how we all have, or should have, someone to look up to. 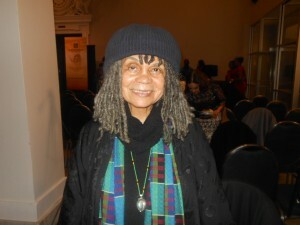 As a student of Black literature in college, to the point that some thought it was my major (it was not; in fact, although I took all the classes that were offered, there weren’t enough to qualify even as a minor), one of the poets I read was Sonia Sanchez. 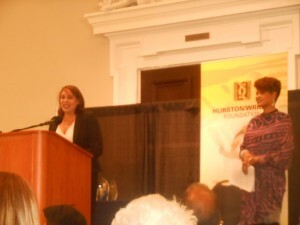 She was present at the Awards to read her original poem for the occasion, in honor of one of the organization’s namesake, Zora Neale Hurston, entitled “Belly, Buttocks, and Straight Spines.” I prefer to read poetry to get the full meaning, but I enjoy hearing it for the sound of the interpretation by the author. Sanchez is proof of why. Her words melted into a rhythm where they barely had definition but you take the meaning and are moved by the flow and the song in her voice and the patterns of sound in English, speckled with snatches of French and Spanish. This living legend of Black literature was an inspiring way to kick off the evening. Northstar Award – U.S. Poet Laureate, Natasha Tretheway who reminded us that as writers, all of our work is grand advocacy for the important work of social justice. 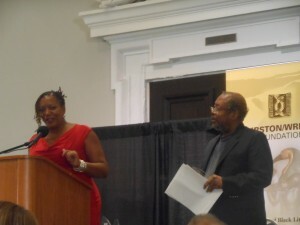 Ella Baker Award – Eugene Allen, the author of the Washington Post article that inspired the movie, The Butler. Ella Baker Award – Isabel Wilkerson, for her epic history of the Black migration from the south to points north and west, Warmth of Other Suns. 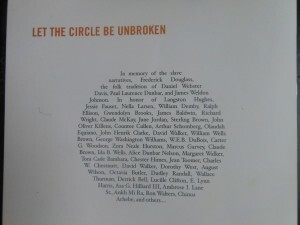 The book was titled after a phrase from the other namesake of the organization, author Richard Wright. Wright was preparing to move from Mississippi to Chicago in 1927, comparing himself to a seed being moved to a better place to grow. Wilkerson suggested that his and other Blacks’ relocation from the southern states to the east coast, Midwest and west coast, was not only about moving, but really about freedom and how far we would go to find it. This is one of those books you hope will be part of the required reading in American history classes and the discussion of reasons for migration. 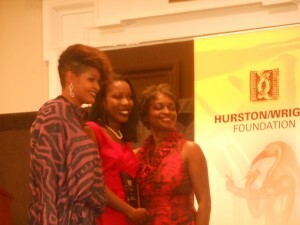 Isabel Wilkerson (center) accepts her Award for Warmth of Other Suns. 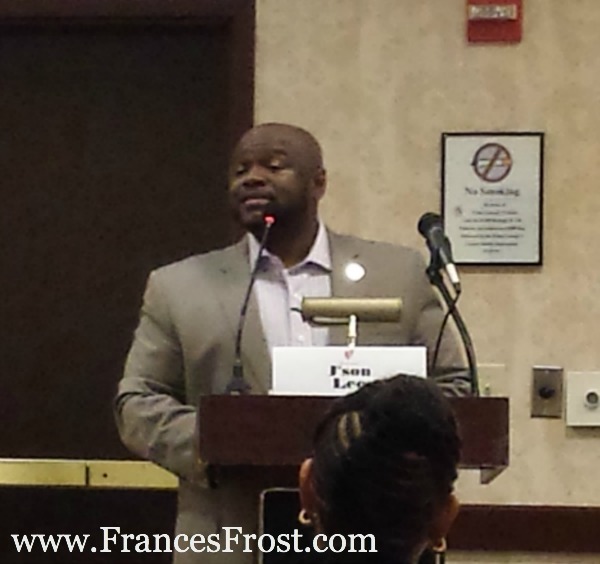 Nonfiction Award – Fredrick Harris, author of The Price of the Ticket, about the election of President Barack Obama. And congratulations to nominee Natalie Hopkinson, author of Go-Go Live. College Writers – Justin Campbell won for an excerpt from his yet-to-be published novel, Sitting on the Knees of God. I’ll be getting this book whenever it comes out, for the title alone. It doesn’t take much more than a good cover and a great title to get added to my list of considerations, and the nominees for Fiction are filling up my to-read list. Fiction Award winner – Gathering of Waters by Bernice L. McFadden. My morning started out with notice that a book review for Life in Spades had been posted. Probably the thing that made me most nervous after sending my novel out into the world for readers to read it, wass waiting for reviews. Readers have posted on Goodreads and Amazon (thank you! ), but this was a book-blog review, a little something different. Thanks to Reads4pleasure.com for posting their thoughts, rating Life in Spades with 4 “chairs” out of 5. They mentioned that “if you enjoyed Terry McMillan’s Waiting to Exhale, you’re going to love Life in Spades.” That was piece one. 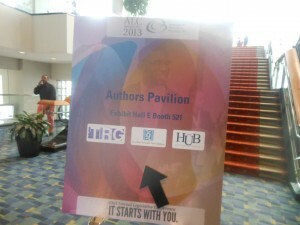 High on those comments, I finished up my coffee and went to the Congressional Black Caucus Author’s Pavillion. And as it turned out, who was on the panel? 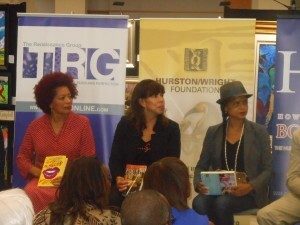 Ms. Terry McMillan, along with fellow authors Victoria Rowell (yes, Drucilla from The young & The Restless) and Chyla Evans, and representatives from popular bookclubs discussing the relevance of bookclubs in the digital era of reading. Victoria Rowell has written several books on her adoption as a child and the adoption of her child. Chyla Evans, interestingly, wrote her novel Fourth Sunday, with five other authors (the book is listed as written by B.W. Read). They started out as a bookclub, then decided to write a book. I mentioned to her after the panel that I barely got along with myself while writing, I was impressed that they were successful with six writers. The panelists made a few points that I thought were quite useful for new writers, like myself. Bookclubs want authors to be approachable. One of the women mentioned asking for an author to visit her club and the author’s agent wanted to charge a considerable amount, in the thousands. Obviously, that’s outside of the scope of your regular bookclub, so they had to pass. Ms. Rowell reiterated this notion, mentioning how she tries to be very flexible in meeting bookclubs whenever and wherever she can fit it in. The readers mentioned getting book recommendations from all over the place – reviews, word-of-mouth, online sites. This makes sense to me as this is how I pick my own books to read. I browse the new fiction section at Barnes & Nobles, yes, the bricks and mortar one with real books inside. I read reviews, but admittedly, only about the first paragraph because I don’t like knowing too many details about a book before I read it. Probably the majority of my books are from friends who said, “here, you should read this.” The take away for me was to get the book out there, get it in as many venues as possible. Of course, I can’t go to a book anything and not come away with anything. 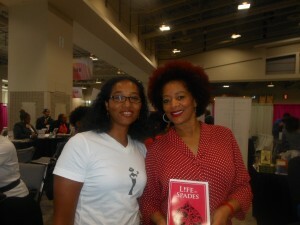 As Ms. McMillan signed her new book Who Asked You?, she graciously accepted a copy of Life in Spades. Will she read it? Who knows, but it felt very special to have my debut novel in the possession of one of the most successful modern Black women writers. I picked up The Boy Who Harnessed the Wind (by William Kamkwamba and Bryan Mealer). It’s about a young man in African that helps to uplift his village by building a windmill. It seems one that I can share with my children. Here’s the line that got me to pick up the third book: “Booker’s Baltimore is equal parts The Wire and Cosby Show.” What? Two of my favorite shows of all time. It could only be better by throwing in Big Bird or a shipwrecked tour boat. And then Sheri Booker read from her newly released Nine Years Under, about a girl growing up in one of Baltimore’s funeral homes, maybe a page or two. Her reading was reminiscent of slam poetry – which I always think sounds so aggressive, but is very attention getting. It was the interesting contrast of this tone with the touching passage she read that caught my attention. I had the book in my pile by then, her reading just solidified my decision. That was all piece number two of the puzzle. The last piece, I left from there and headed to Baltimore to meet with a newly formed bookclub for their first meeting. I was honored that Life in Spades was their first pick and thank them for having me join them. I rounded out the evening with dinner with my sister-in-law and her family, enjoying a great big bowl of shrimp and grits and peach cobbler. Then what can you do after that, but go home and go to sleep? You can’t have a book titled “Life in Spades” without actually playing spades at some point. With about 50 friends and associates, we held our first event, a Spades Night & Book Launch on May 21. Yes, on a Tuesday night, of all days of the week. Why? Of course because that’s when Gina, Sherry, Laura, and Cookie play spades. And, in keeping with their tradition, we had delicious munchies – crabcakes, pork sliders, egg rolls, and a full cheese platter – and plenty of drinks. With brand new decks of cards, we got down to the spades games, folks pairing off with friends and new friends. We had guys vs. gals, and couple vs. friends. All in all, I think everyone had a great time. So much so, that several guests mentioned that I need to have another one soon. To throw your own spades party, here’s a few simple suggestions. Offer a fun prize. We had Sangria drink mix, crystal ice buckets, shot glasses, and gift certificates to cater a party from Savory Gourmet on the table for the winners. And do you need to be reminded to have fun? Enjoy!